Poor working memory or attending skills are often misinterpreted as reading comprehension deficits. When a student scores poorly on reading comprehension tests, it is often not a problem with comprehension at all. You might assess a student you thought had poor reading skills and discover they can actually understand the meaning of single words and individual sentences with little trouble. So when this student reads reads a longer passage, why they can't answer basic questions about the text? We can all relate to the experience of having to read the same passage over and over, simply because we had our mind something else. We read each word on the page, and we have the skills required to understand the text -- we were just mentally preoccupied, and didn’t follow the text in our mind. And more importantly, we didn’t paint the mental pictures necessary to comprehend what we read. People with ADHD or dyslexia experience this same attention deficit, but in a more profound way. Gemiini's Associative Memory Tool for reading comprehension uses a simple puzzle to help students practice focusing and paying attention. In this activity, students are shown a randomized sequence of images from the Gemiini clip library, and then asked to remember the order that each image was shown. When using this tool, students should be taught to imagine fun little stories that tie the images together in order to hold the information. In setting up this activity, you will be able to choose from 2 to 30 images in a series. Over time, with enough practice, the increased attention gained from these activities will carry over to other tasks, like reading. Well-known dyslexia interventions such as Lindamood Bell, Wilson, and Davis employ similar exercises. The difference with Gemiini is that once the strategy is taught to a student, they can use the tool on their own, at their own convenience, and at a greatly reduced cost than other forms of therapy. 1. Log in to Gemiini with your managing account. 2. Select the Tools navigation button. 3. Select Associative Memory from the Tools page. 4. Under type, choose whether to create a puzzle from items related to a certain theme, or to use random items from one of our pre-made videos. If you choose "Themes", select a theme from the drop-down menu. 5. Toggle whether to use the same video for all puzzles in the activity. If this box is checked, you can toggle whether to scramble the order of the puzzle after each attempt, so that the puzzle is different each time. 6. Under Difficulty, select Easy or Hard. The "Easy" level shows several images for each item in the puzzle, and gives the viewer more time to create the story. The "Hard" level shows only one image for each idea and forces the viewer to “think fast” in creating the story. 7. Choose the number of images to be shown in Length of Puzzle. This is how many images the student will be shown. The greater the number, the more difficult the puzzle becomes. 8. Toggle Automatic Difficulty Advancement to automatically add one more item to the puzzle after each correct attempt. Turning this on activates the Length of Puzzle (Goal) menu. Select how many puzzle pieces you want to be the end goal of the puzzle. 9. Toggle Play Sound when Successful to enable/disable the sound effect after a correct answer. Turn this off for students with sensory issues who might be frightened or overstimulated by the sound. Once you've set up the puzzle, you can Preview it or Assign it directly to your student by selecting the "assign" button. Choose who you would like to assign the activity to, and select "Send Assignment". It will appear on that student's assignments page. Select play to start the activity. When you play the game, instruct your student to create a story in their mind that ties each item to the next one in the sequence. I can't eat my toast out of a frying pan! I need to find dishes to put my toast on. And milk! I need a glass of milk! I found some flour, but I don't need flour for my toast and milk. When the sequence is over, students remember the story to place each image in the correct order. The correct answer is shown. then the options are given to go to the next puzzle, repeat the same puzzle, or scramble the sequence of the same puzzle to try it in a different order. Select finish to quit the activity. If you try this puzzle yourself, you'll feel your brain straining to remember the sequences. Children love to play it, but it can be mentally exhausting, so we recommend playing no more than 3 puzzles per sitting. Once the puzzles get to be over 15 images, even playing it once through per day is enough to see results. As with any therapy, expect to see gains over time. Attention and memory are neurological attributes, and it takes time to make an impact. For someone with profound dyslexia or academic challenges, it may require months of practice to reinforce neurological pathways. 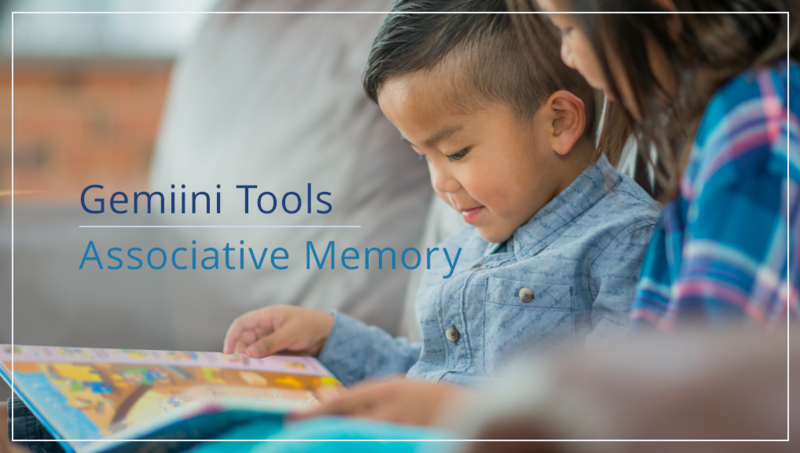 Gains made with Gemiini’s Associative Memory Tool will eventually begin to bolster student performance in reading and in other areas of academics - you'll notice students focusing better and remembering more information. So, Why wait to get started? Log in to Gemiini and set up a puzzle for your student today!